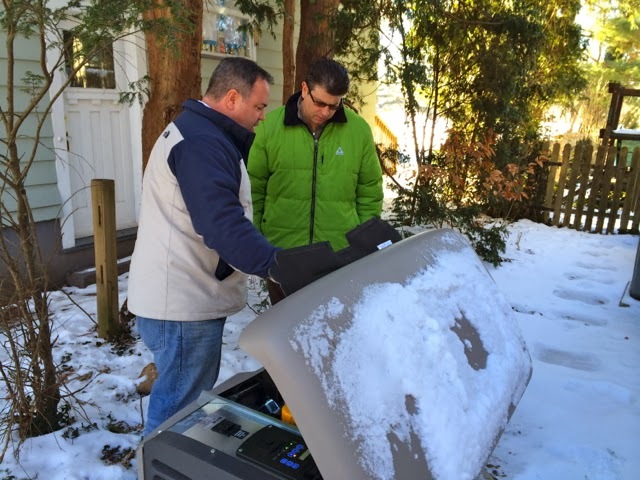 We've been talking about getting a generator for years, but Superstorm Sandy clinched it. We ended up in a hotel for a week, until the power came back on in our neighborhood. Many of our neighbors stuck it out in the 45-degree weather, but Max's muscles get tight because of his cerebral palsy and we didn't want him to be uncomfortable. The electricity in our area is generally not very reliable—it has a lovely habit of going out for a few hours during storms. And we need to make sure our sump pumps work; flooding from Hurricane Irene destroyed our basement. Generators can be even more critical for families with medically-fragile kids who use machines that require electricity, like ventilators. 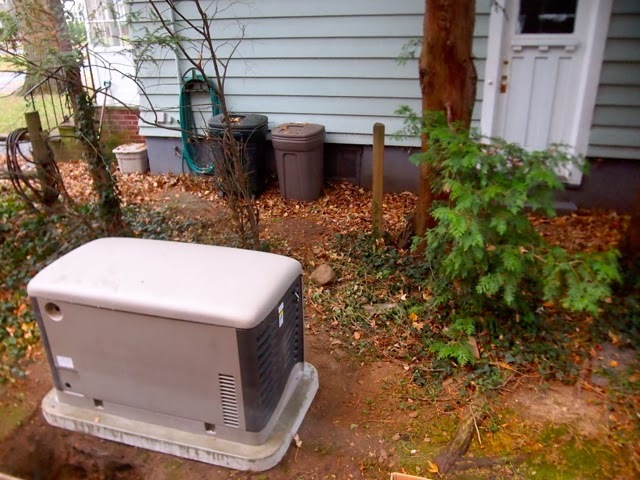 We looked into standby generators, aka the kind that hook into your natural gas line. During Sandy we'd seen the people at gas stations—gas cans in hand, waiting in line for hours to fuel up their portable generators—and a home backup generator seemed worth it. We decided on a Kohler. From the research I'd done online and reviews I'd read, it was clear they're the best, most highly-rated kind of generators. Friends who have them only have good things to say. ConsumerReports magazine (I subscribe, because I am geeky that way) gives Kohler home generators top ratings for ease of use, power delivery, power quality and noise. I'd met up with some Kohler staffers at the BlogHer conference; I got in touch and we received a discounted generator so I could share our experiences. It arrived this fall and sat on our driveway, all 535 glorious pounds of it. We got the Kohler 20kw, a fully automatic generator powerful enough to rev up the entire house within 10 seconds after the power goes out—all appliances, the heat or AC and Sabrina's hair dryer because it's a basic life necessity, of course. It has a commercial-grade engine; a corrosion-proof enclosure; and a five-year, 2000-hour warranty. (If we ever run it for more than 2000 hours, I may just consider a move to Mars.) The suggested retail price starts at $4197. We spent about half that on a hotel stay. So we figured it would pay for itself in the upcoming years (global warming: it's real). Remodeling magazine estimates that you recoup 68 percent of the cost of a standby generator if you sell your home. 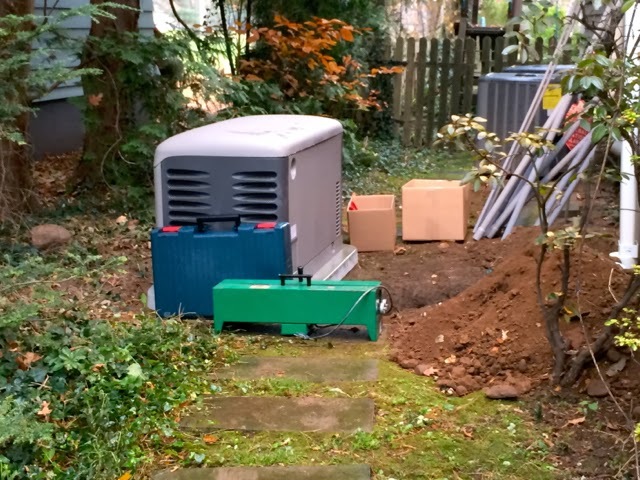 Getting a generator installed is a process. Not a hard one, but it's not insta-gratification. First up: Finding an authorized Kohler dealer to do the job. Super-nice Kenny Halligan of Halligan Electric Co. was our man. If you're getting a portable generator, give it a test-run before you're dealing with a storm situation. More portable pointers: They're for outdoor use only—not for enclosed spaces, like a garage, and need to be kept away from windows and doors. Don't operate them on a combustible surface, either, like a wooden deck; place them somewhere level, with the exhaust directed away from building. Also, note: You most definitely do not want to connect one to your barbecue, as a Kohler rep said she'd seen. Eep. Our utility company had to determine that the flow of gas into the house was enough to fuel our home and the generator. Check! Then we needed to decide where to put it. Our local building code requires generators be placed a minimum of 5 feet away from a house, plus a 2-foot setback from your property line. (I know I sound like an expert but sorry, I am not for hire.) Our generator ended up in the narrow yard on one side of the house; there was just enough room. Kenny filled out the permit paperwork, we dropped it off at our town's building department, and two weeks later we had it in hand. Kenny and his crew spent the better part of the day at our house, installing the generator on a concrete pad and doing a massive amount of wiring. They turned off the electricity for a few hours, which was no biggie given that we aren't going to be without power ever again. The install involved digging a major hole to connect gas pipes to the generator. If your kids like dirt, they will really enjoy this part. The automatic transfer switch (aka the brains of the generator), which connects to the electric box in our basement. A plumber came by on another day to run the gas piping from the basement to the generator (all in all, the install cost us about $4000). 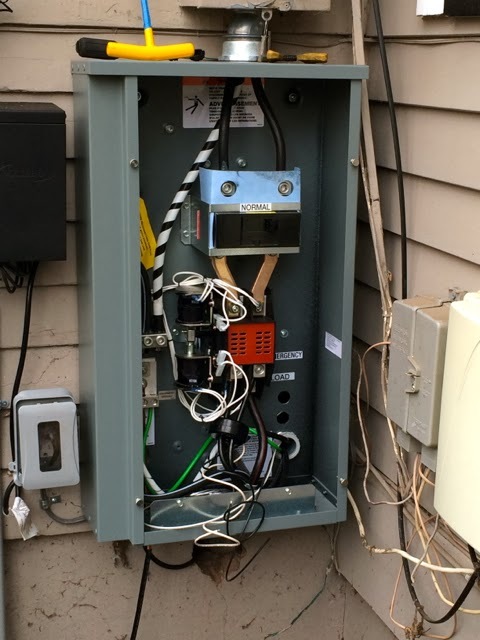 Then we had to have the electric/gas company install a larger meter, to accommodate a bigger flow of gas should we use the generator. Happily, that was free, probably because they'd be glad to have us using vast amounts of gas. Last, four different town inspectors stopped by at various points—the building inspector, fire inspector, plumbing inspector and electric inspector. (Did I mention this was a process?) Everything passed with flying colors. Our generator kicks on for 20 minutes once a week, every Friday, to make sure it's humming along. It's reassuring to hear it come on. I've heard portable generators and they are loud. At 69 decibels, the Kohler 20kw sounds like how the air-conditioning HVAC does when it starts. (As a comparison, leaf-blowers range between 95 and 102 decibels). Honestly, even if it sounded like a combination of a techno concert, a construction site and an erupting volcano, I wouldn't have cared. I just want our house powered up when the next storm hits. We received the OnCue Generator Management System ($262), which is Windows compatible (you can have your Mac piggyback onto Windows). It basically connects your generator with Kohler's servers in Wisconsin, though sadly it does not import cheese from there. 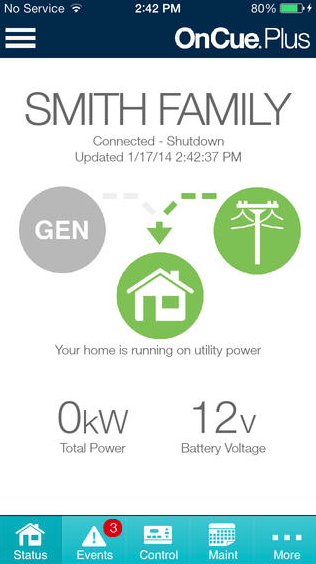 With OnCue you can see real-time power operation, make sure that all components are working and even turn the generator on and off via your computer. Once a week the OnCue system sends a "Generator is running" update to my email, which is very reassuring to read if you are at work and a major snowstorm is happening. There's an OnCue Plus app, so you can check your system on your iPhone in between rounds of Candy Crush. We're considering an annual service contract with a local Kohler dealer, who will help with monitoring and do an annual check-up. Most important, if our generator ever needs a tune-up in the midst of a storm, we'll be on a priority list. Otherwise, maintenance during a power outage is pretty straightforward: You check the oil with a dipstick, just like a car, after the generator has been on for about 8 hours, and change it after 100 hours of every use. (If you can't get to the generator because the wind will blow you away, at the very least check the oil after 24 hours of running). The tank holds three quarts of oil—ideally, 5W-30 Full Synthetic Oil. Kenny makes sure Dave knows how to check the oil, because I'll be hiding under our comforter if we ever have another superstorm. 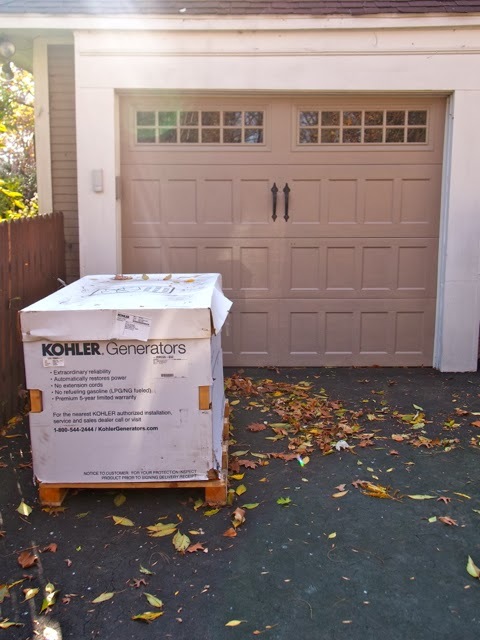 You can get a quote for a Kohler generator from a local dealer with this form. I'm glad we haven't had reason to use ours yet, but I have no worries—just peace of mind. And, sure, come on over during the next storm...as long as you bring chips and dip. We received a discounted Kohler 20kw generator and OnCue, but the opinions and peace of mind expressed here are solely my own. Kohler has a really great showroom in Wisconsin with amazing installations of designer kitchens and baths (think IKEA vignettes, but like 100x more expensive). AND A SPA. So you should come visit. I live in AZ and don't need a generator, but I want one because it looks so COOL! (seriously). Thanks for the info! We are currently in the process of pricing out this project for our home! This is good for storm-prone areas, but, as a desert dweller, I don't think I'd need this. My family and I got a generator after Hurricane Sandy last year. It's especially comforting to know we have it so I can charge my power wheelchair! Your installation experience seems like quite the little adventure. As a Kohler Generator employee and owner of a 14kw Kohler Generator, your blog put a smile on my face and pride in my heart! Thanks so much! We got the Kohler 20th whole house generator and love it. Installed March 30,2013 and we have already used it over 32hrs! Storms seem more severe. Love it! We have a local propane company who works with a local electrician and I ordered it on one day at 9am and it was installed the next day at 9am and running by 130pm. We live in a rural area so no hastles. Highly recommend. We do dialysis for 8hrs every night at home and so far have needed it for 3 nights. A real life saver!!!! I seldom have issues here in Ohio.. Since I live in a rural area and have propane heat, a boiler, I am thinking of installing a 7.5 KW unit salvaged from a motor home.. I think I'm handy enough to do most of it myself.. COMPENSATION .WHY prepare at Great Personal Expense , just for OTHERS to take it away ; when You need it the Most ? ? ? Just went through a major ice storm in NC, have a 20kw standby that worked like a charm! Had lights, heat, and did not lose any food. Purchased it about three years ago and it was the first time it had any significiant use, but would not give anything for it. Wife (who was one of my critics when I purchased it) has not stopped thanking me for getting it. Amazing how opinions change. I've had my Kohler 20RES for about a year and a half and I do have to agree with you on the value of the solution. I'll venture to say that if you are DIY capable, there are a few things that you can do yourself to prepare for a standby generator installation. My installation in Ohio only ran about $2500. First, dig and set your own concrete pad -- if you are capable, once you have your permits and know where you are putting the unit, set your own 6" concrete pad. Don't just set the unit on gravel -- give it a good anchor. Don't purchase from a local dealer... shop around and look for the model # that includes the service entry rated ATS. I was able to get my 20kw unit for $3800 including onCue. Make sure you get a kohler authorized electrician for the install, but you don't need to go to the most expensive local dealer. Same with your gas plumber. The more that you price shop your contractors, the less you pay. If you don't want the hassle and have the extra money - The kohler dealer will sub out all of these for you, just not at the same low prices you would get. The oncue remote software is great.. and now that it is also available on android, even better. I feel so much better that with my family at home while I'm working... i dont have to worry about power outages and my kids or wife trying to setup a portable generator safely... it just works. Moved from a big city on the west coast to a very rural area in Virginia. Prior to arriving, a "Derecho" of historic proportions struck June 29, 2012 and my area was without power for 9 days. If you are near a hospital or police or fire station you will be a higher priority for recovered power but if you live remotely you are at the bottom of that list. And no power here also means no water as we are on wells. First thing I did when I moved in was purchase a Kohler 20kw and a larger propane tank (switched from 120 to 325 gallon). Although I've only lost power a few times this winter and been snowed in, the security of heat, water and the necessities of life is priceless. Next to moving here, it's the best purchase EVER!